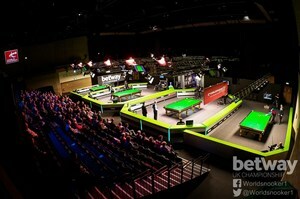 UK Snooker Final Close To Sell Out. The final session of snooker’s Betway UK Championship in York in December has virtually sold out. The tournament runs from November 22 to December 4 at the York Barbican and fans have snapped up tickets since they went on sale in May, with less than 20 remaining for the concluding session. Supporters are now strongly urged to book seats for remaining sessions fast as other days are expected to sell out soon. One of snooker’s Triple Crown events alongside the World Championship and the Masters, the UK Championship has been held in York since 2011. Last year, Australia’s Neil Robertson lifted the trophy for the second time after beating Liang Wenbo 10-5 – making a historic 147 break during the final. Other winners of the title in recent years include Ronnie O’Sullivan, Mark Selby, Judd Trump, John Higgins, Shaun Murphy and Ding Junhui. The tournament features a flat draw with all 128 players starting in the first round at the venue, giving fans the chance to see many of the top stars on a single day.